Update July 2017 – According to DBElectronics, the SuperUFO Pro 8 is designed badly and may cause excessive wear and tear on your SNES console. Way back in 2012 we reviewed the SuperUFO Pro 8 SNES/Super Famicom flash cartridge. While it won’t ever be our first choice of flash cartridge, it’s still a fun little upgrade to your classic console. You can read the full, original review here. The SuperUFO might not be as sophisticated as the almighty SD2SNES, but it does have some unique tricks up its sleeve. Most notably, there’s a cartridge connector on the top of the unit. Using this connector you can plug in any SNES/SFC game you own, allowing the game to effectively piggy-back the SuperUFO. By doing this, you can actually dump the attached cartridge to the SD card in the SuperUFO or even dump the save-game data on games that support battery backed up saves. Recently, we started selling the latest and greatest SuperCIC boards, both as DIY parts and as a fitted upgrade. The SuperCIC is a fantastic upgrade for any SNES/SFC console, particularly for PAL machines, since PAL games regularly run at the wrong speed and/or in a small window rather than full screen. Once you’ve upgraded your SNES with a SuperCIC, you can play any compatible/unoptimised PAL titles in 60hz or any Japanese or US SNES game at its correct speed. There’s just one problem with this, American cartridges are physically too wide to fit in a European (or Japanese) SNES console. One way around this problem of course is to simply widen the cartridge slot. This works well and gives you a console that’s completely region free. Not everyone wants to go down this route though. While installing a SuperCIC board means no cosmetic changes to the console, cutting a wider cartridge slot certainly DOES mean a cosmetic change and when you run European or Japanese software or when the cartridge slot is empty, there will always be a gap visible around the cartridge slot. Back when the SNES was current, there were a range of import adapters for the console, such as this popular “Honey Bee” model. These adapters typically took two cartridges; the import game you were trying to run and a cartridge from your consoles native region. The adapter then tried to trick the SNES into reading the CIC/Region lockout chip from the native cart, while booting from the import cartridge. The trouble with these adapters is that they don’t always work and they can interfere with the more modern, 100% compatible SuperCIC boards. Rather than take a chance on an adapter that might not even work, why not use a SuperUFO as an import adapter? 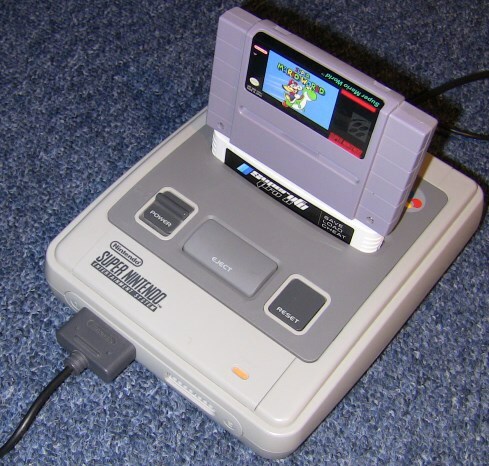 The cartridge is perfectly suited for this, simply plug it into any SNES or Super Famicom (it’s region free and fits all SNES consoles) then plug your import game on top. Power the console back on, select the top left icon and choose “Play Cart” and you’re good to go. The SuperCIC will kick in (if it’s in automatic mode) and change you over to the correct refresh rate (50 or 60hz) automatically as soon as your game starts. There are a couple of minor down-sides to this approach. Firstly, your import game will have to perch on top of your SuperUFO. If you knock your SNES console too hard the game may freeze. A gentle knock shouldn’t effect it, but if you’re tempted to push the cartridge with your finger, expect the game to freeze or crash. Secondly, the SuperUFO costs £49.99, that’s another £50 onto the price of making your SNES region free. For £50 you could probably source an American SNES console instead, though that means two different machines to hook up to your system. Of course, the SuperUFO cartridge does way more than just act as a simple import adapter. For many long-time SNES players, the save game backup facility is worth the asking price on its own, though if you haven’t gotten around to backing up your SNES save games yet, it may already be too late. The SuperUFO cartridge can still be purchased at Retro Towers here. Heh nice write up, I recently put my SuperUFO back to work as a region adapter in this same way only I’m using it on a US SNES with a Super Game Boy 2 attached.